Well I'm nearly ready to rout, but after reading through posts and other forums, I'm not sure wether Braid or tape is the way to go! I've decided to build a small test track first, then attempt something bigger. Which is the best way to go? Tape or Braid. I would go with braid if you can afford it. It doesn't seem to be affected by temperature change like tape can and it will last alot longer. I'm no expert but if I build a routed track then I will be using braid. I have been reserching routed track building for about a year now and were to use copper tape or braid. The copper tape I think does not sit flat on corners and will lift in very hot day if your track is in a garge like my is, for me its copper braid at $1.16 plus tax a meter will do me. 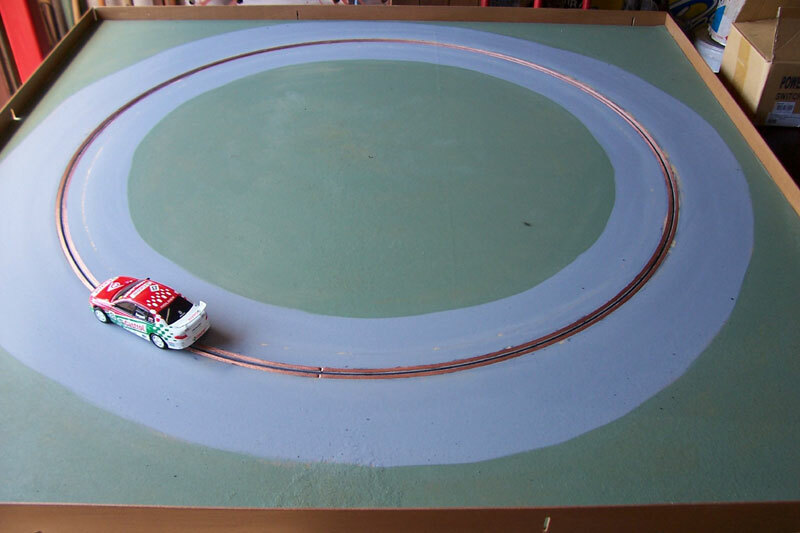 I have just finish a test track which will be my skid oval to test differant paint sufaces and tires before I start my new four lane track which will be around 24 meter lane lenght. Bo - where are you getting your braid from? If I can get hold of some I'd love to have a crack at a routed track. I got the braid from Hartland Cables 18-20 railway rd Meadowbank NSW Ph 029807 6155 and speak to Paul ot terry, very heplful guys. The part number for the braid I have used is HBB005 it is 4.70MM wide and will handle 20Amps each. I have heard of this mob and they seem to be the place to go. Are you having much luck with the paint types. I know Ged used a roof sealant for his track. Just finished the oval today, it is painted in flat grey under coat. Now I will be testing tyres to see what works the best. Hi Guys about three months ago i finished a routed three lane track,photos in members tracks section,i used copper tape because all the stuff i saw on the net said it was great and some that i spoke to said the same. NEVER again down here in Croweater Country and under a carport the weather affects it too much so much so that i have not used my track for nearly a month and a half,i am about to sell my track and build one from Artin track as i have found that just as good to drive on. If i build another routed track it will definately be braid,take it from me it,s not worth the chance that it will be okay for you it is definately cheaper but never worth it in the long run. many of the pro tracks down here use Blackboard Paint with excellent results. Painting routed tracks, I saw on another site last year this bloke painted his track with floor tilers glue, because it's got very fine bits of rubber in it, and he said that he found the cars getting better traction than just paint. One of the tracks that I race on has tape. He has had no issues with it lifting (its in a steel garage) but he is having all kinds of issues with power supply. I think its personal preference. I just dont like the way particular members on a particular forum badger you into thinking that braid is a waste of money. Smoggy, what Solver variety did you use? Most of the guys down south (of Adelaide)use ferrador, made by Dulux. I went into Solver and they had no idea what I was talking about. Hoffy I think you might find that if you walk into a dulux store and ask them about ferrador they will give you a blank look to. To best of my knowledge you can only get ferrador in SA from the dulux mile end store/trade centre. The Best Damn Brewery in Australia. The Best Damn Brewers too. I had braid on my commercial track and still have it. Home track has tape and even down here in Tassie it gives problems in my TIN shed but is O/K if you can control the temperature. Now that the commercial track has gone I intend to use the brai from that on the home track it is still good after 15 years. Ferrodor paint is abrasive used to be used a lot when COX cars were still on sale! It used to wear out Cox tyres! No days almost any semmi gloss enamel paint will work fine. We mainly have used Dulux sati or semi gloss paint but one guy has just left his track undercoat gray and that works fine. Our routed track is just painted with flat interior house paint. If it hasn't been used for a long while, it's pretty slippery for the first 20 minutes or so, but then it's good. If you are using your track regularly, then this won't be a problem. The thing that I like most about this finish is that you don't get a large change in grip levels when the tyres of the car go from painted surface to running on the braid itself. As the car slides through the corners, on say a high grip track surface like Ninco, and the inside wheel rides up onto the rail, nearly all the drive is transfered to the outside wheel, which often causes a tendancy toward snap-oversteer. Not helpful for novices or people with tired old reflexes. Dulux do still make Ferodor. It's availalbe through your local Dulux trade centre and is listed as a paint for bridges and other outdoor metal structures. It too is a good paint for the surface. It tends to buff the tyres on the cars and offers a bit extra grip particularly on low speed tracks. I have resisted the temptation to re-paint our track with it, (despite constant encouragement from a couple of friends), mainly because it is pretty hard on paintwork. If you roll a car over on a fast track this might mean grinding through the paint and back to the bare bodyshell in one race meeting, (if you crash as often as I do). As for braid or tape, I have found over the years that tape is quick and easy to use but has a tendancy to be higher maintainence, particularly in warmer climates. The inside edge of the outer tape also tends to get pulled up by the cars in corners, as tape sits on the surface rather than being recessed into it. Braid, whilst more work to lay initially, is very low maintainence. Our track is layed with braid and it has never given us any cause for concern. There is a handy booklet produced by Parma about building your own track and this is a good place to start. Hi Hoffy i used Solver Duraguard Slate Grey,as i said tho it is great with the cars low on power but the faster cars ie Commodore they tend to slip when you give them a burst on the other end of the spectrum the Scaley Lister storm handles it brilliantly,and is the fastest car on the circuit,i think it is just a case of finding the right tyres for the type of surface. my old home /routed track has braid on it. it never has lifted during the times when it was with me. the track i go to at willoughby has stick -on tape.it tends to lift mostly in the corners. i think oscar has sold the track to a bloke from newcastle area. the track is so good that there is so little difference between running rubber and sponge tyres. i was going to use tape on my track but am having second thoughts my track is going to be stored outside under a pergola, and while i will put a cloth over it will still cop a bit of temperture changes. what kind of glue is used to hold down the braid or does it come with sticky on one side? do you guys paint the entire track then stick down the tape, or tape onto bare MDF then paint around it? My old 1/24 track had braid that had been put down with contact cement but as I rebraided I used hot melt glue and it was a lot easier. The braid slots were painted but in some places the paint had lifted and it did not seemt o make any difference. Rene, the guys around where I live use liquid nails to hold the braid down. That seems to work quite well, as i have rarely seen a lift yet. Just wondering what ferador (spelling?) is actually used for normally? is that blackboard paint? or is it something completely different? I'm in planning on a routed track myself, and opting to go with braid, however i have been trying to find alternate solutions, to the point of even using long lengths of 5-mm copper tubing, so it would form and sit nicely into a groove and be a lot harder wearing. (copper tubing of various diameters from plumbing or supplies etc). I also considered running something thinner like maybe 2-3mm solid copper wire, but wonder how many problems i would have with the braid-pickups making contact (although my experience with AFX track that using only 1mm rails works great). I realise the copper tubing or wire would be somewhat more expensive, but it would basically never need maintenance compared to braid and especially copper-foil. Regarding braid, would it be better to use a tinned braid rather than plain copper? avoiding corrosion etc? I have several 100's meters of Video coax cable (broadcast use) that i can strip the outer coating easily, but the braid is tinned....i'm also considering just leaving the inner core inside, so it'd be a solid round length of braid that would fit nicely into the routs, just like tubing would. Ferrodore was developed in the sixties as a protective coating for steel structures. It is very abrasive and gives good grip with some tyres,personally I think tyres have developed to a stage where they will give reasonable grip on most surfaces. I really like the look of Ferrodore but don't like the abrasive surface that is why the surface on "New Warwick Farm" appeals to me,the look of Ferrodore but the surface of normal paint. You should be able to by braid cheaper than copper tube and a lot less work. The idea of using Coax shield is not new. I raced on a track years ago there this had been used,the guy was an installer so had plenty.I looked at it for my track but was just too lazy to strip it all. I would remove the inner so the braid will lay flat and about 6mm wide. Tinned or copper does not make any difference. Peter at Mobile Raceways can supply tinned braid at a good price so check with him before you start.